After smartphone and tablet war its now Note. Samsung is winning lots of money from the crowd with its 5.3-inch Galaxy Note which is unique in the market till now. 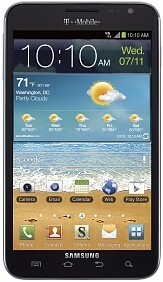 Samsung Galaxy Note landed on US soils few months ago and doing great with AT&T network. Now its time for T-Mobile guys to give it to their customers. The T-Mobile Galaxy Note comes with a Qualcomm S3 chipset, instead of the Exynos 4210 used in the international version. There is no LTE supports here, instead this Samsung Galaxy Note gains support for what T-Mo call 4G - 42Mbps HSPA, while the Note N7000 network support is limited to 21 Mbps. But you will be very happy to know that this Note comes with the best OS as built-in. The T-Mobile version comes running ICS out of box and is also SAFE-certified It means it has a full suite of enterprise-ready features and capabilities, including support for top-tier mobile device management (MDM) providers, on-device AES256-bit encryption, enhanced support for Microsoft Exchange, as well as integrated support for a range of virtual private network (VPN) solutions. T-Mobile will start shipping Galaxy Note within few days from now. We don’t hear anything about its price yet from T-Mo.